Cloudy skies early, then partly cloudy this afternoon. High 57F. Winds NW at 10 to 15 mph..
Seaside’s Alexander Teubner was selected for first-team offense and first-team defense. 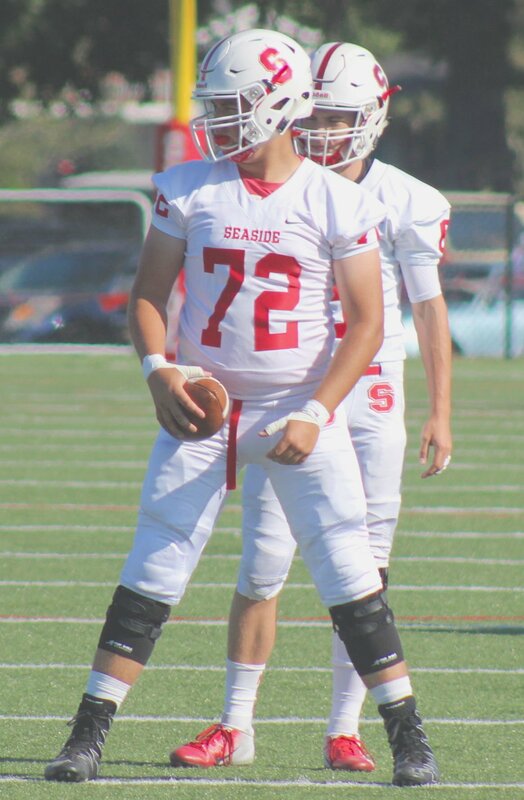 Senior Travis Fenton was one of three Seaside offensive linemen named first team all-state. Seaside quarterback Payton Westerholm was named honorable mention all-state. Astoria senior Justin Villa was selected as an all-state honorable mention receiver. The Cowapa League was well-represented in the 4A state championship football game (Banks vs. Seaside), and also on the recently released 4A all-state football team. Specifically, the Braves and Gulls combined for 12 of the 26 total first-team selections. Among the 104 all-state first team, second team and honorable mention positions, state champion Banks had 11 selections, including several players who were named both all-state offense and defense. Topping the list were Banks seniors Blake Markham and Hayden Gobel (the offensive and defensive players of the year, respectively), while the Braves’ Cole Linehan was named coach of the year. The Gulls finished with seven total selections, including four on the first-team offense. Senior Alexander Teubner was one of two first-team running backs, after finishing the 2018 season with 2,420 yards rushing and 44 touchdowns. Ironically, Markham was not named the offensive MVP of his own league — that honor went to Teubner, the Cowapa League’s offensive player of the year for 2018. Teubner spent much of his season running behind offensive line teammates such as seniors Travis Fenton, Isaias Jantes and Paxson VanNortwick — who were three of the five first-team all-state offensive linemen. Joining those four was senior Payton Westerholm, an honorable mention quarterback. Teubner was also named as a first-team defensive back, and senior Gio Ramirez was selected as a linebacker on the second-team defense. Astoria’s lone all-state selection was Justin Villa, a senior honorable mention receiver.